This Microboards Playwrite Blu-Ray External Recorder is the professionals’ choice for digital and high-definition media storage. The Playwrite allows users to record high-definition Blu-Ray Disc content while also delivering the ability for high-capacity data storage. Connect to your computer via USB 2.0 or eSATA. 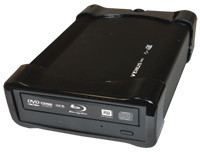 The drive can read BD-ROM discs, read/ write single layer BD-R & BD-RE discs, read DVD-ROM, and read/write most any DVD recordable media formats. It’s the same great Pioneer Blu-Ray technology you’ve come to expect, only in a convenient external enclosure! Software and cables are included. This page was updated Tuesday, November 2, 2010 at 11:04am by Microboards Marketing Department.